Last summer we met with our parish's DRE about Cecilia beginning sacramental prep, which is required in our diocese, this fall. Our DRE, who I admit I'm not fond of for a few reasons, simply stated that she would not be permitted since she would not turn 7 until January and every child had to be 7 before prep began in October. She further said that exceptions were rarely made and then it was along the lines of a relative dying or something. So we wrote a letter to our pastor explaining our request and reasons, fully believing Cecilia to be ready and quoting canon law with regards to our right to have our pastor make the final decision. Our pastor called and asked to meet with us after Mass. Our meeting with him went quite well. He was very pleasant and I think only asked Cecilia one question when I mentioned she was studying latin. Mostly he asked us about our background, studies, and instruction of Cecilia. In the end, he said he had no problem with her beginning sacramental prep and, indeed, even said she would probably be more prepared than most of the kids in the program. Cecilia and I attended the one mandatory meeting in October. We received a packet including a book for Cecilia to read through with me and do activities in (the Jesuits were smart and put stickers in it) and were given notice of optional meetings. We also watched a video of Fr. Joe Kempf on the subject of the sacrament of Reconciliation. 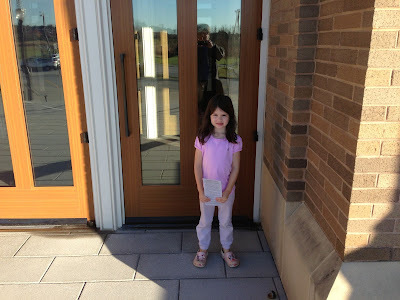 Afterwards, Cecilia and I worked through the book and James took her to one of the optional meetings, an opportunity to see the inside of the confessional and watch a role-play of the sacrament with our associate pastor. Our parish has a Reconciliation Celebration scheduled for tomorrow night when the kids are assigned a priest and receive face-to-face at an assigned station around the inside of the church. Cecilia wanted our associate pastor and wanted to receive anonymously, as is her right. When we met with our pastor, I specifically asked him about when she should receive First Reconciliation knowing the parish did it before Cecilia would turn 7 and he simply said he would leave that up to us. Our associate pastor was more than happy to meet with Cecilia and on Saturday, November 17th, Cecilia received her First Reconciliation. She was so excited and we were so proud of her. My deepest Congratulations to my darling and growing-up-much-too-fast Cecilia and my most heartfelt thanks to God and our beloved Catholic Church for making it possible. P.S. - There was, likewise, one thing about the prep that was simply awful. In Fr. Joe's video, he tells the story of the Prodigal Son to the children and then equates the son's behavior to a boy who decides to run away from home. The video even included footage of the boy packing a suitcase and leaving his house and walking away down the street. Now, as a mother whose children have not considered so stupid a move much less considered how they would actually do it, it rather ticked me off to be at a mandatory meeting that put such an idea, with visuals!, into my child's head. Then, the book they gave us that we worked through, again went through the story of the Prodigal Son but said simply that when he returned he was given a party. Cecilia put two and two together and asked me, "So, if I run away and then come home again, do I get a party?!?!" That was right about the moment I wanted to take the packet and chuck it at the DRE. I informed her that, no, that wasn't quite how it worked and she was missing the point. I ranted on Facebook. And then my husband, the theologian, mentioned that the Prodigal Son story's primary point is not the forgiveness of the one son but the response to the son who did not leave; it is about rejoicing for the return of the lost brother. James said a better story would be the one of the lost sheep. Which, makes sense as that story is included in the Catechesis of the Good Shepherd program for 3-6 year olds and is a much simpler story and includes the loving image of Jesus the Good Shepherd. So, if you are doing sacramental prep with your little one, I heartily recommend skipping the prodigal son bit and going for the lost sheep parable instead. I also think it is simply a more approachable parable for young children too. P.S.S. - I don't know, since I don't know any of the other kids or families who will be at the Celebration tomorrow night, but I do have to wonder how many of those kids are hopping excited to receive and if not even giving them the option to receive anonymously will have any effect with regards to how they view the sacrament or how eager they will be to go again. The DRE told me she has had parents tell her how much they love the Celebration and being able to see their child receive, but I do have to wonder just how the kids feel about it. As one who generally prefers to receive kneeling anonymously, I know it would make a difference for me. The Catechesis of the Good Shepherd program also has a presentation on the Prodigal Son...it is approached differently than how it was done . We sometimes do it as part of a first communion retreat. But we don't usually give it to six year olds. At that age, it is much better to stay with the image of Jesus and the Good Shepherd/the Lost Sheep, because of the dedicated love Jesus has for his sheep. Six year olds "get" that image; the participants in the prodigal son will confuse them unless it is presented correctly. Maybe you could ask one of the Level II catechists at your atrium about that presentation. It's weird to me that parents are so eager to see their child receive. It seems like that shouldn't be something 'on show' for parents. I don't know.... that just rubs me the wrong way! So glad for Cecila though! What an inspiration to us adults who find the sacrament challenging! Congratulations to Cecilia! Glad you were able to allow her to receive in her own way, in her own time. I have no idea if this makes me sound insane, but I'm gonna say it anyway. This post brought tears to my eyes. What a beautiful little girl! What a testament to how wonderfully you and your husband have raised her! What a blessing to have such a shining little example of all that is good and holy in the world. Oh, that little saint-in-the-making is in my prayers. Just... wow. Thanks so much for sharing! <3 <3 <3!